Laser diodes are very fast devices that react rapidly to changing voltage and current. While this is a benefit in applications such as signaling, it is also a potential liability. Laser diodes are vulnerable to electrostatic discharge (ESD) events and power surges. Blu-ray and low-power red laser diodes are particularly susceptible to voltage spikes, since any increase in applied voltage beyond normal operating parameters will cause both optical and electrical overstress. Anecdotal evidence suggests that many laser diodes fail long before their life expectancy. One reason is ESD and power surges generated during power on/off cycles. Voltage spikes are often produced at these times, and their cumulative effect on laser diodes is detrimental. Existing design solutions for ESD and surge protection don’t work well — or at all — for laser diodes. In fact, in our testing (shown at right), none of the commonly employed methods for ESD protection are reliable for laser diodes. A common failing of existing methods is to exceed the normal operating voltage of the laser diode, thus allowing excessive forward-bias. Based on our extensive testing and evaluation, we determined that a new method of protecting laser diodes was needed. A hybrid component could keep spikes from exceeding the diode’s normal operating voltage, and would also absorb high energy in the circuit until ESD or power surge subsides current was shunted way from the diode. To solve the ESD problem, in 2008 Pangolin Laser Systems developed an electrical component called LASORB. The word LASORB is a combination of the words “LASER” and “ESD ABSORBER”. The LASORB component is easy for engineers to implement because it is small and can simply be connected directly to the pins of the laser diode. For details on testing procedures, see our datasheets. The change-of-voltage approach is a very good principle to use for laser diodes because, under ordinary circumstances, even during modulation the voltage across laser diode pins does not change very much. Therefore any change of voltage – especially a fast change of voltage – is an abnormal event, something that happens only during ESD or other types of electrical faults. To allow for complete flexibility and customization of individual laser diode requirements, the LASORB component is implemented as a hybrid, containing active silicon and passive components. And as a side-effect of the makeup of this hybrid component, LASORB also offers protection from reverse bias conditions, thus allowing LASORB to offer complete protection of the laser diode from a variety of electrical faults. LASORB is available as a small, through-hole component, which costs between $2 and $8, depending on the quantity. Engineers can choose from several LASORB part numbers that dictate the actual slew rate, surge conduction time and maximum operating voltage. For pricing and ordering information, click here. This webpage has a technical description of LASORB’s approach to ESD protection. It includes a description of the LASORB circuit symbol (shown at right). 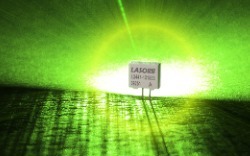 A Photonics Spectra article gives a good overview of how LASORB works to protect laser diodes from ESD.